Stylish sneaker shoes from the USA, each with removable wheels in the heel. Including wide and extra-flat rollers with two high quality bearings and robust 8mm steel axles. The sole tread pattern also without wheels for a safe foothold. 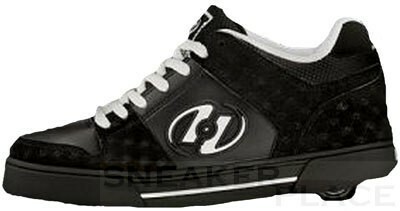 Immediately after their invention in the USA started the HEELYS to conquer the Asian markets. Today, these shoes are also very popular in Europe. The tool to take out the rollers and the wheel covers for the housing are included. Important: These shoes are ??smaller. Please order one size larger.